A chameleon's ability to change color in a fraction of a second is surely the closest thing to a magic act in nature. Even though scientists understand how the little lizards do it, why they do it is disputed. Among experts, the mainstream theory has been that these quick-change artists aren't so much interested in camouflage as communicating their state of mind to other chameleons. However, a 2008 University of Melbourne study suggests that the chameleon not only uses color change to make himself invisible to enemies, but is even capable of customizing his color palette to the visual capabilities of different predators. Even if chameleons couldn't change color, they would be well camouflaged because they live in environments that match their natural skin tones. Most of the more than 180 species of chameleons live in Africa, many on the island of Madagascar. They can move and focus each eye separately and when they spot a tasty bug, their long tongue, which has a tip like a suction cup, shoots out and slurps it up. When a chameleon wants to warm up, he turns darker to absorb more sunlight, and turns lighter when he wants to cool down. If the lizard is frightened, angry or in a romantic mood, he might change color to let other chameleons know. South Africa's Smith's dwarf chameleon has two deadly enemies: a shrike that impales the lizard on thorns before eating it and a venomous snake called a boomslang. In a 2008 University of Melbourne study involving 16 chameleons, researchers found that the lizards consistently color-matched themselves more precisely to their backgrounds when presented with a model of the shrike, which has excellent eyesight, than the snake, which doesn't. When a snake goes after a chameleon, he usually approaches from below and moves towards the light, so the chameleon hides in plain sight by making himself paler, the researchers concluded. But looking down from above, the shrike would spot any chameleon that didn't blend in perfectly with his background. 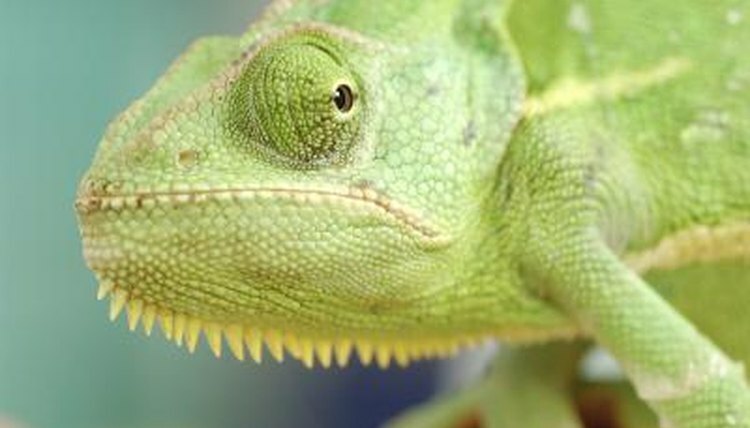 Scientists at the University of Cambridge call chameleons "just phenomenal," but say it's a "myth" that they change color to camouflage themselves. Their skin is covered with several layers of very special cells called chromatophores that respond to chemicals from the nervous system and bloodstream. Inside these cells are tiny sacs containing color and when the signal comes, this color is released and spreads throughout the chromatophores. They only have four shades to work with -- yellow, red, blue and brown -- but like artists, chameleons mix colors to produce other colors, like red and yellow to produce orange. Some coleoid cephalopods, a group of marine animals that include octopuses, squid and cuttlefish, are capable of camouflaging themselves so well, even against backgrounds with extremely complex patterns, that they are rendered virtually invisible. Even more surprising: these animals are known to be color blind. A 2011 study conducted by the Marine Biological Lab in Woods Hole and the U.S. Military Academy in West Point used state-of-the-art imaging technology to try to unravel the mystery of how they do it and found that the camouflage strategies of these animals to avoid detection by predators was based not on color, like the chameleon's, but on the manipulation of light. The Naked Scientists: How and Why Do Chameleons Change Colour? Phys.org: How Can a Colorblind Animal Change its Colors to Blend into the Background? Which Lizards Can Move Their Eyes in Two Different Directions? Can Chameleons Hear You Talking? What Are Some Traits That Help Octopuses Survive?